Fifteen lavishly detailed Southern houses in Atlanta, Georgia, South Carolina, the Virginia Piedmont, along the Florida coasts, and in the mountains of North Carolina, from a leader in traditional architecture. Esteemed Atlanta architect Norman Davenport Askins made his name with his mastery of historical precedent. His gracious and livable designs recall such diverse sources as Italian Renaissance country villas, hillside castles in the Dordogne, and the very strong presence of the Colonial Revival and Federal houses in Atlanta and the greater South. Inspired by Tradition presents a portrait of Southern elegance through Askins’s trademark infusion of traditional design with understated innovation and style. New color photographs of interiors and landscape, commissioned specially for the book, complement traditional hand-drawn plans and elevations. 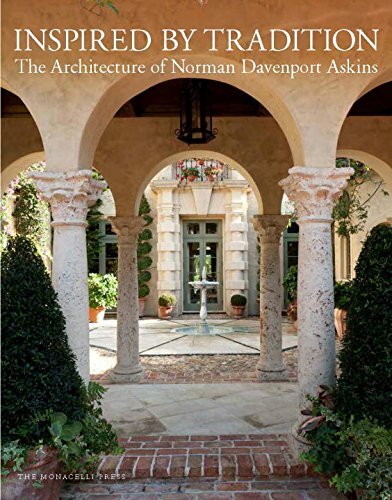 In a special section dedicated to “Elements of Tradition,” Askins identifies the key components of traditional design and the parameters for using them successfully. Ultimately he believes in approaching tradition with innovation and individuality—adding touches of glamour, humor, and romance that bring his houses to life.